To keep up with current news, please visit our Facebook page and "like" or "follow" us there! 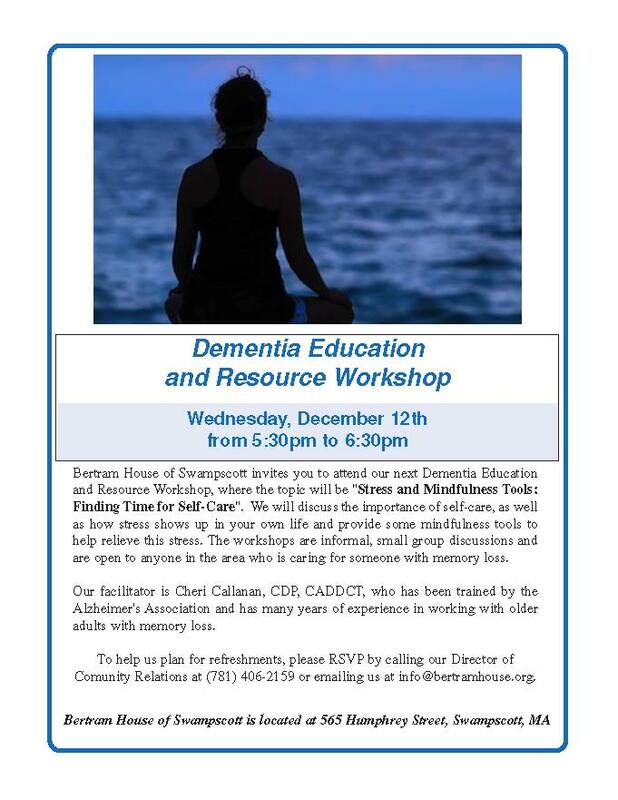 Please join us for our December 12th Dementia Education and Resource Workshop, where the topic will be "Stress & Mindfulness Tools / Finding Time for Self-Care". We will discuss the importance of self-care and ways to find some time to care for yourself. We will also discuss how stress shows up in your own life and provide some mindfulness tools to help relieve stress. Our Dementia Education & Resource Workshops are open to anyone in the local area who may be interested in learning more about dementia, or who may need support in caring for a loved one who is living with memory loss. Each workshop begins at 5:30pm, and lasts approximately one hour. These workshops are free and open to the public, and are held in the library at Bertram House of Swampscott, 565 Humphrey Street in Swampscott, but we do request that your RSVP if you would like to attend. Click here to print a flyer for this event.